Let me tell you about the perils of drink. Over the Christmas holidays, a period of the year I generally spend entirely intoxicated, I happened upon Celebrity University Challenge. I enjoyed it because the alumni representing their alma mater were obviously all earmarked as probably being thickies so the questions were a bit easier. This meant I could answer loads of them and look clever and perhaps not as drunk as I actually was (which was 'quite'). It was not all wine and roses, though - although ironically it often was wine and Roses - because there was An Incident. The Incident happened somewhere in the area of space between Jeremy Paxman's mouth, my ears and the bit of my brain I use to remember things. "Who was the British Prime Minister who won the Grand National whilst serving his term of office?" I could not remember what the name of this gallant and wonderful man was, but I squirreled away the date I thought he said - 1894. "Now there's something worth blogging about! ", thought drunken me, and I wrote it down on a piece of paper. (Yes, I plan this stuff in advance). What a triumph of the Corinthian ideals of the Victorian era! With no immediate threat from ICBMs or Trades Unions to occupy him, the Prime Minister got on his horse and won the bloody Grand National! Now that is a story. 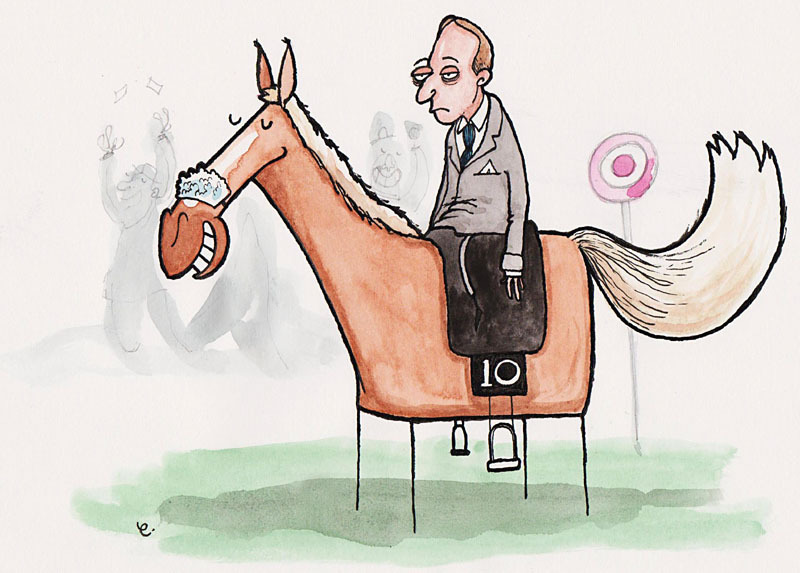 Other Prime Ministers should ride the Grand National. In fact, they should be entered into the race every year as one of their prizes for winning Prime Minister Idol or whatever the hell it is we call it these days. The public could then vote on what horse they get to ride. 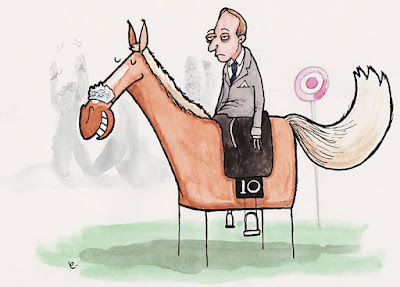 Popular PMs, such as Lloyd-George, Churchill or Clement Atlee (these are the only ones, let's be honest) would get to ride Red Rum probably, while John Major and Sir Alec Douglas Home would have had a skankmule. David Cameron could ride Gideon. When Wikipedia stopped making Britain well aware of the fact that we don't have a lot of say about American political issues on Thursday morning I looked it up. The British Prime Minister in 1894 - Archibald Primrose, Earl of Rosebury - was indeed a racehorse man but it was as an owner that his horse Fat Nev won the 1894 Derby at Epsom. My brain and liver had conspired to ruin everything. But I am not one to be discouraged by such a thing, so I now present the blog post as I wanted it to be written, complete with accurate illustration. One of Archibald Primrose, Earl of Rosebury's first acts as Prime Minister of Great Britain was to win the 1894 Grand National at Aintree. In a triumph of the Corinthian Spirit, he cast aside his dispatch boxes and sat astride the unfancied mare Manky Mave. In spite of starting odds of 60-1, he lapped the field, a stunning achievement in a two-lap race on a horse that had whooping cough and was, it was later discovered, quite heavily pregnant. This is brilliant. I think perhaps you could start a series of fictional historic posts.